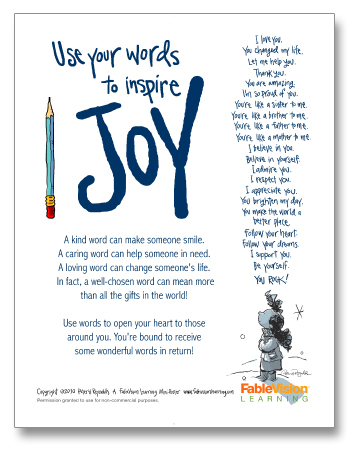 As a gift for the holidays, we are offering you this free downloadable poster by Peter H. Reynolds! Don't delay, because this popular poster will only be available for free until January 5, 2013. After that, you can find it in the growing collection of posters in our online store. If you would like to share this beautiful message in a BIG way, visit our online store to order the 18" x 24" poster. Remember — a few kind words can have a powerful impact on someone's life! Let's all use our words to spread happiness and inspire others.